So, I was browsing the Lush website because I was looking at my Prince Charming shower gel and saw that though bought about two months ago now, it's only half way to empty and it reminded me how impressed and happy I always am about Lush products. I don't often splurge at Lush because I the products are a little more expensive than I'd like really, but also because I can't actually afford to spend too much and I don't often get the chance to. That said a girl can dream of a luscious Lush haul and I have made a list of all the things I'd like to try from Lush at the moment. Top on my list are the things I can use in the shower since I have an en suite shower in my room, like Wash That Man Right Out Of My Hair (Shower Gel), Happy Happy Joy Joy (Hair Conditioner) and Rosy Cheeks (Fresh Face Mask). I'd also love to try one of their lip tints because I'm really intrigued by this Latte colour and I'm also keen on trying a couple of their new bath bombs for those days I get to steal the big bathroom for myself an hour or two!﻿ That Lava Lamp one looks a lot of fun to watch! 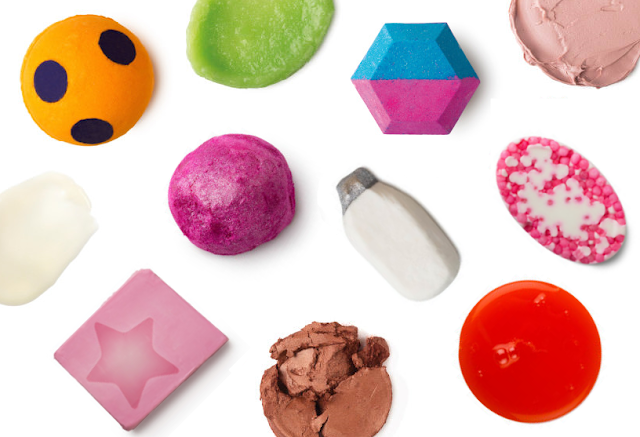 What's on you Lush Wishlist right now? I haven't been to Lush in soo long! I need to pop in soon!